Friends, do you remember the Thai Film called "Crazy Little Thing Called Love"? Well, it may not ring a bell to you, but for me, it marked the birth of my interest to the Thai culture which very much include the cuisine. 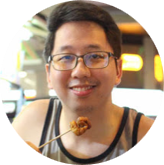 I even wrote a brief blog post about it back in the early days of my blogging with a kind-of flimsy title "Thai Craze, Music and Etc." Yeah, I was pretty much into the culture of Thailand that time which made me watch other films as well. Up until now (although it may have faded a little already), I still have that spark in my eyes with anything related to the Thai Culture. This may sound very much ironic and possibly dumb for you after that introduction, but I haven't indulged myself to Thai cuisine until just last week. Well, don't ask me why because I don't know how I would explain that as well. Oh wait, I think I know the reason why. Whenever I suggest to eat in a Thai restaurant, someone in the family will grimace. 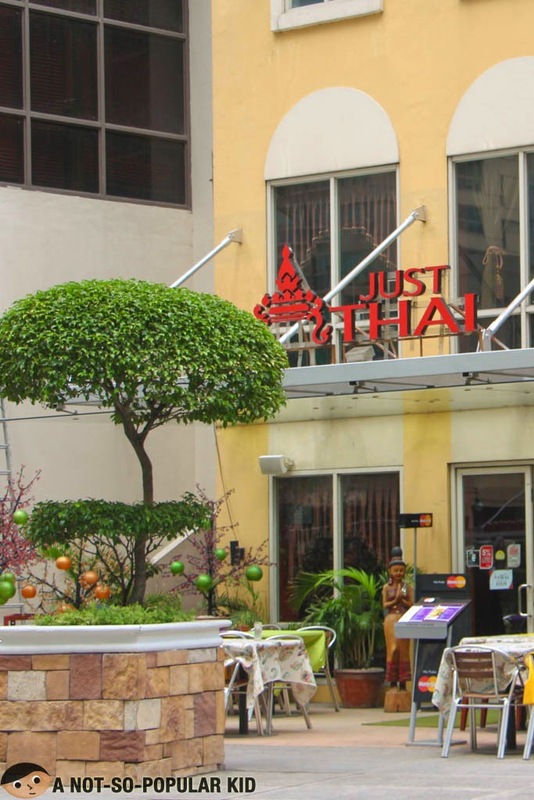 Anyway, as I was saying, it was just in the 3rd of July 2014, that I was able to really feast on Thai dishes, and it happened in this great place called Just Thai in Burgos Circle of Taguig City. I was pretty much nervous and excited at the same time but I just put a game face on, and entered the place. 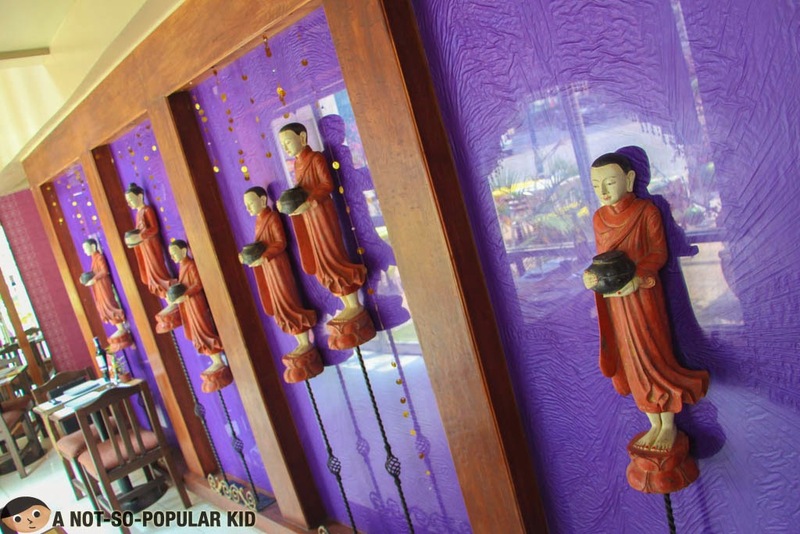 What I liked upon entering the restaurant was the refreshing blend of Thai elements in its interior mixed with some modern touches. 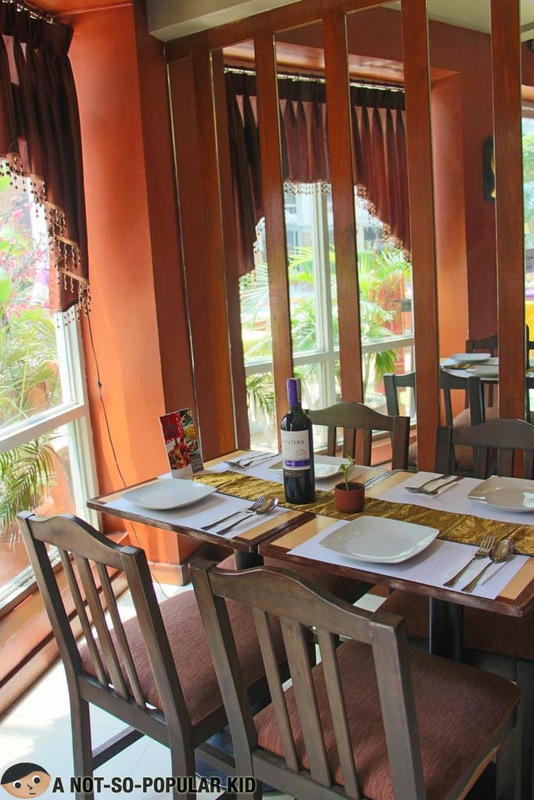 I know some people prefer to be deeply immersed with the culture the restaurant is representing. Honestly, I do too most of the time, but since it would be my first time, I appreciated the light and relatively subtle immersion of Thai ambiance. Anyway, two words that will summarize how the place felt like are classy and homey (yes, both at the same time)! Alright, now that you got an idea of the place, let's fast forward to the main event - the food and drinks! 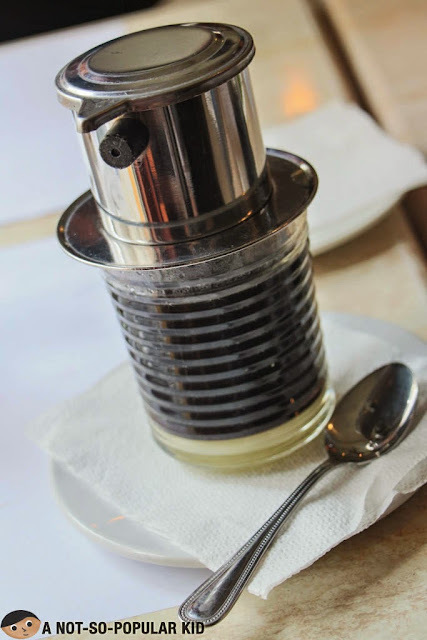 One of the things Thai Cuisine is famous of would be the drinks, so permit me to dedicated a portion of this blog post for some of the beverages of Just Thai. 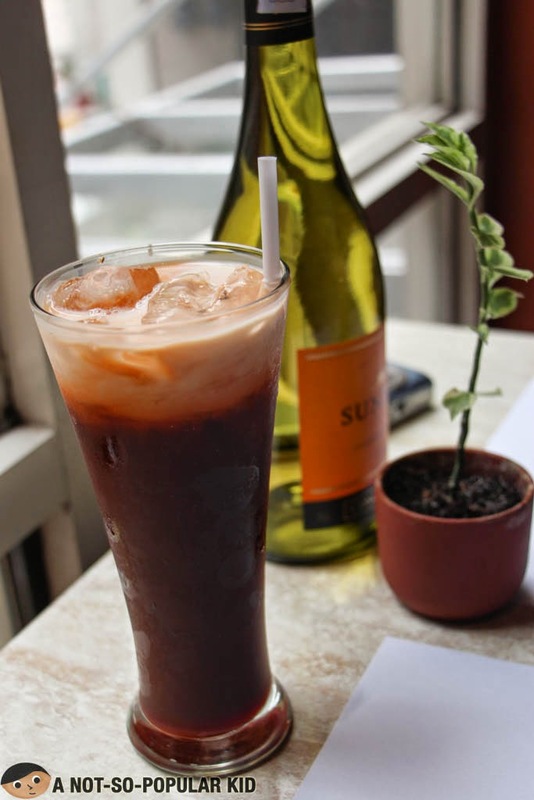 This incredibly refreshing Thai Iced Tea brought extreme excitement to my palate. Well, I must admit that at first sip, I was baffled and somehow bothered by the weird mix of flavors, but it was actually my fault because I didn't know that you need to stir the drink so that the layer of milk on top can combine with the tea. Still, I suggest that you give a sip to this drink before you stir, so you will have an idea of the authenticity of the Thai tea. I still believe that the palate needs to adjust especially if it will be your first time to try something like this. Frankly, at first I thought I dislike the drink, but upon minutes of sipping on to it, I slowly began to appreciate the play of flavors! 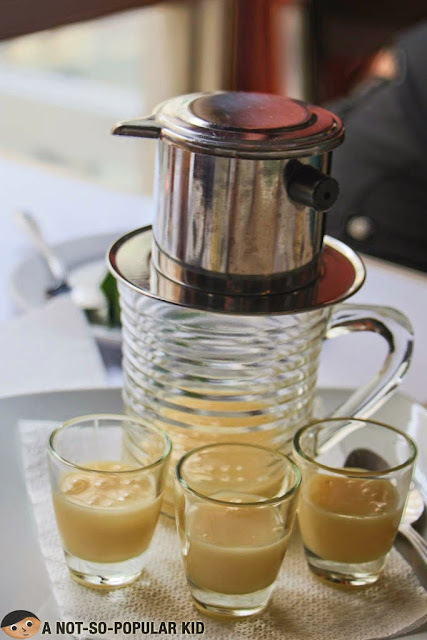 Recommended for your regular tea time (as a stand alone), for the Tom Kha Gai - "Chicken Soup in Coconut Broth" (very complementary) and for other spicy dishes (to balance 'em out). Note: According to the manager of Just Thai, the tea used for this drink is genuinely imported from Thailand, which I don't cast a doubt on because it was evidenced by its authentic subtle bitter aftertaste. 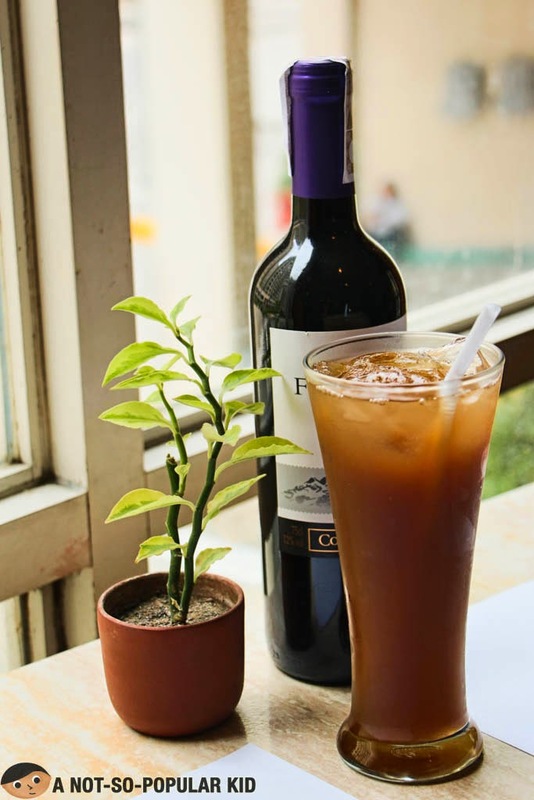 Another top recommended drinks here in Just Thai according to the manager is the Tamarind Juice which I have to agree with, and I have to tell you that the the Tamarind Juice has the potential to rejuvenate and awaken your senses with its incredibly tangy and "nakakakilig" taste! Recommended for heavier dining experience (just light as opposed to the Iced Tea because of the absence of milk) and for non-spicy dishes. The amazingly fantastic soup of Just Thai - a true first for my palate! Although deceivingly unphotogenic, this chicken soup featured a very rich and potent taste with a revitalizing aroma of lemon grass. What I found very much surprising is how the coconut broth didn't taste like the ordinary "gata". In fact, it was just light and complimentary to the overall flavor of the soup! Also, aside from the light creaminess, the dish had a subtle sourness that really added a layer of unique zest! Note: By the way, all the ingredients settled at the bottom of the bowl, but there's a sufficient serving of chicken and other veggies. 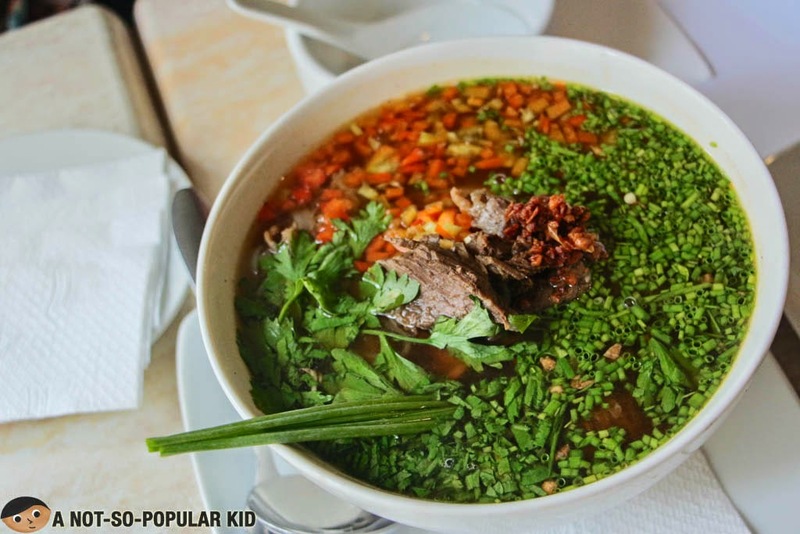 Stewed Beef Noodle Soup - mix of potent flavors highlighted by spiciness! The first thing that I was able to note about this dish was the aroma of the soup. As you may see in the photo, the soup was filled with several herbs and spices. This explains the aroma as well as the distinct flavor of the dish. You need to note, however, that the soup has a kick from its spiciness. The good thing, though, was the spicy flavor didn't sting, but instead gave an adventure of flavors. 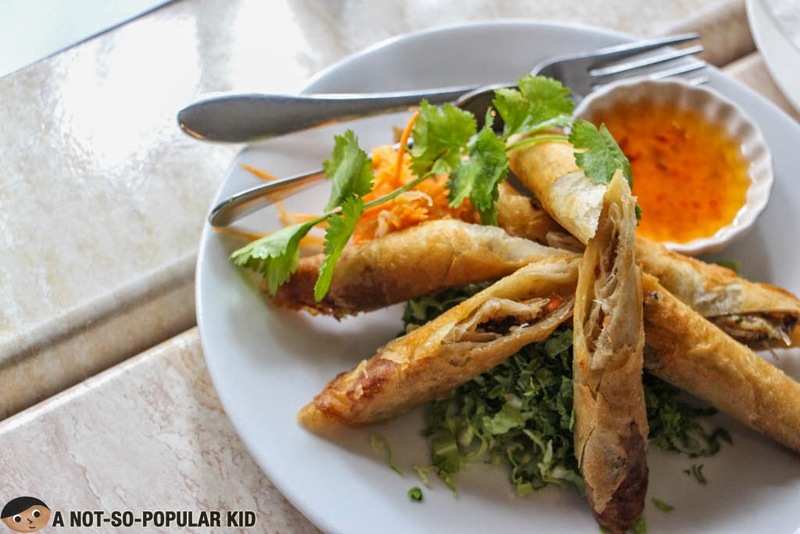 The Thai Spring Roll was nicely done with with light and refreshing taste. I would say that I liked it because nothing was too overpowering to steal the scene, plus there was a subtle (more like a hint of) sourness that sparked up my taste buds. 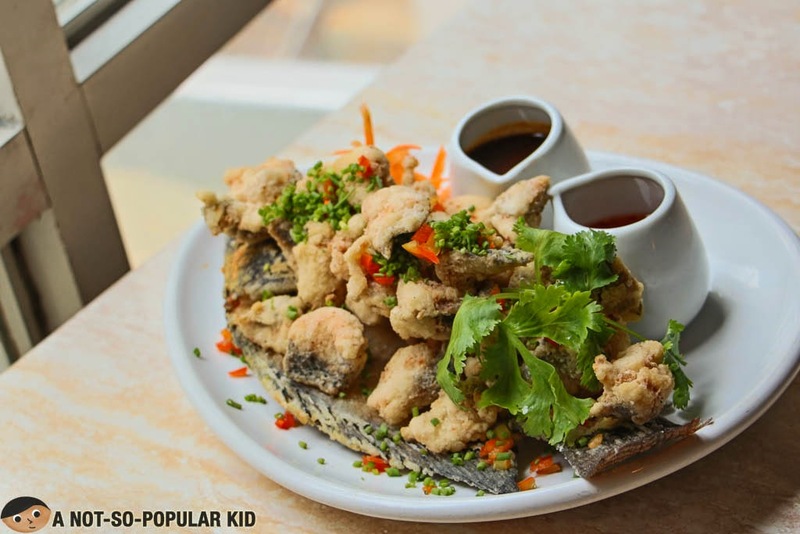 The good thing about this appetizer is that it can serve as a bridge between Filipino cuisine (or even Chinese) and Thai cuisine. This is because of our familiarity with the flavor and appearance of the dish e.g. lumpia). 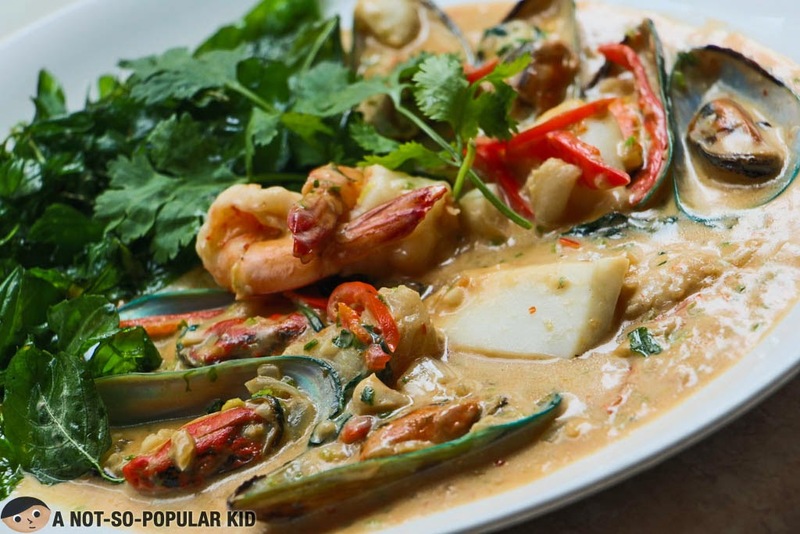 Hence, if it will be your first time to try Thai, be sure to add this one up to ready you! 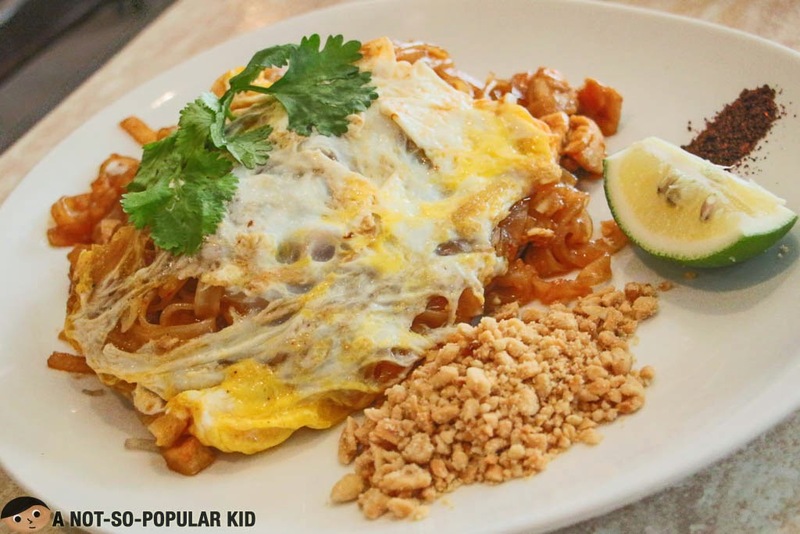 This Pad Thai was something I admired because of the appropriate level of sweetness. Also, this was the first Pad Thai I tried that had a really diverse flavor. The peanut gave a different dimension while the egg provided more balance to the overall taste. 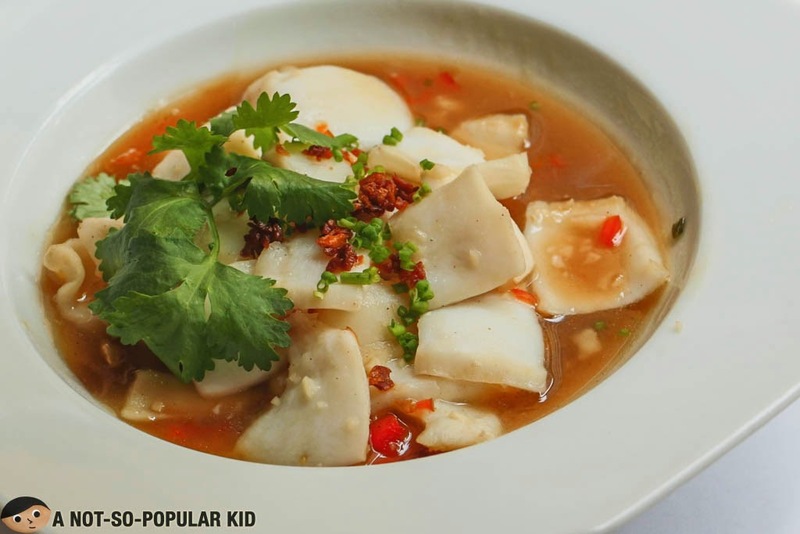 This Squid dish offered a tender texture of squid as the latter swam in a sweet-garlicky sauce. I'll say that the flavor was simple yet suave. Alright, we are halfway through my friends, but I need to pause for a while to give honor to this amazing dish that I definitely fell in love with! And this love is different from those that I had before because it was love at first sight (i.e. plated very beautifully) and then love at first bite. The reason why I hailed this as the best dish of the day is the delicate frying employed to come up with a crispy yet ironically soft fish bites (i.e. fresh and not over-fried causing the fish meat to be tender). Plus, the tamarind sauce (which I heavily suggest that you use) brought a lot of tangy and energetic flavor that really enhanced the majesty of the dish! It's a definite must-try, based on my experience. 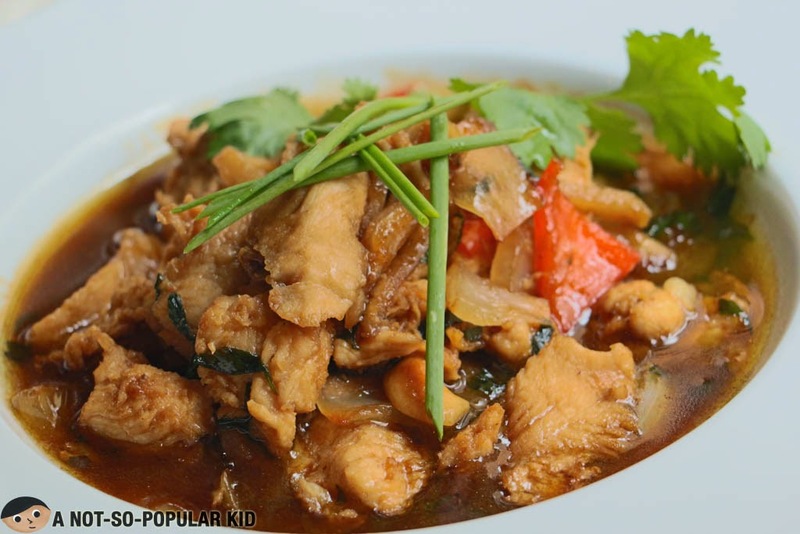 This stir-fried chicken was sweet and savory highlighted by a soft peanut flavor that made it unique! Friends, to tell you the truth, I was thinking of not trying this dish out because of the taste I had in my mind. However, when I actually got to try it, I was surprised! It was entirely different! This Mixed Seafood in Basil has been a favorite in this particular branch (since there's another branch in Molito, Alabang), and I understood why when I had a taste of the freshness of the dish! It offered a sour yet mildly sweet & spicy zest that matched well with the lightly creamy sauce. Also, with its price, you are surely a winner! Up close - Thai Bagoong Fried rice after mixing it up! 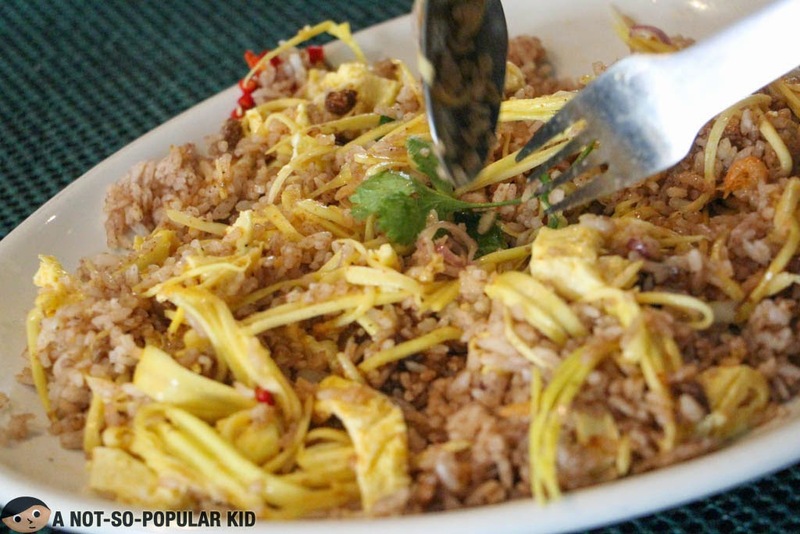 This Thai Bagoong Fried rice was something different because of the huge diversity on the plate. 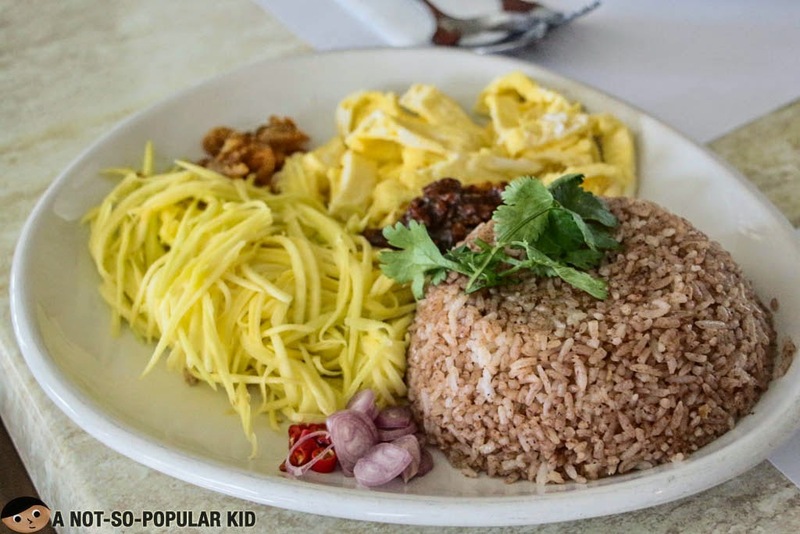 There were 6 major flavors found in the dish which are completely in harmony with each other - bagoong, green mango, small shrimps, sweet pork, onions & chili and fried egg. I was able to sense the superb quality and authenticity of the dish! This Thai Sticky Rice had a semblance with the Chinese Butchi dish, since both are usually served warm and sprinkled with roasted sesame seeds. 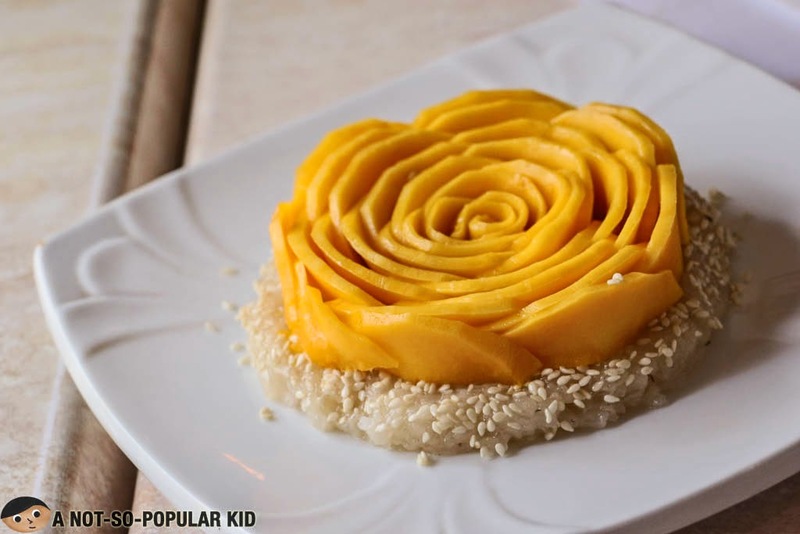 The difference falls on the sweetness of the sticky rice which was just right, and slowly faded off with the sourness of the mangoes on top, which by the way was designed artistically and beautifully. The Coconut Sauce shouldn't be ignored, but instead be used to further enhance the dessert. Adding that one completely takes away the semblance with your ordinary Butchi. 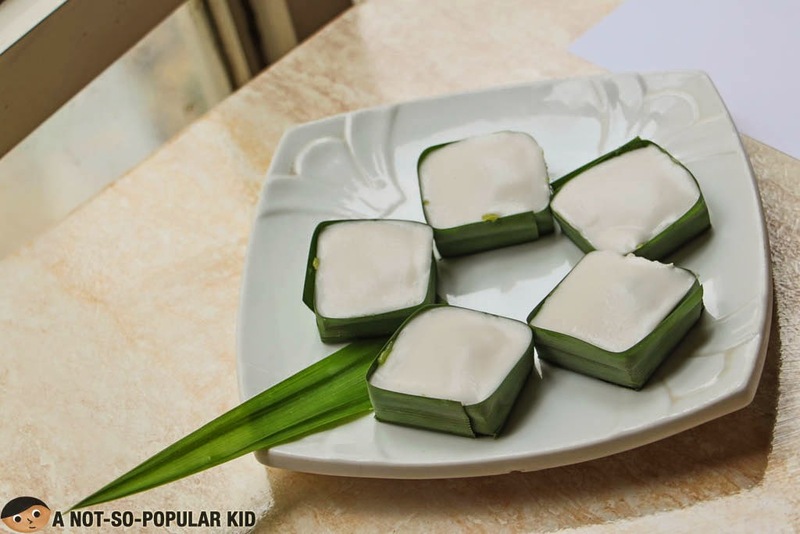 The unbelievably good dessert of Just Thai - Tha Kho! Oh my goodness! 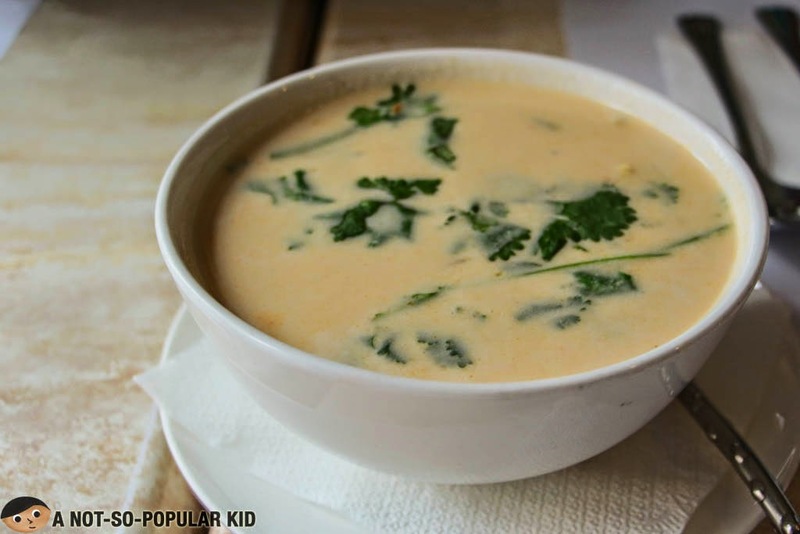 The Tha Kho was extremely yummy with its wonderful layer of savory coconut pudding on top. 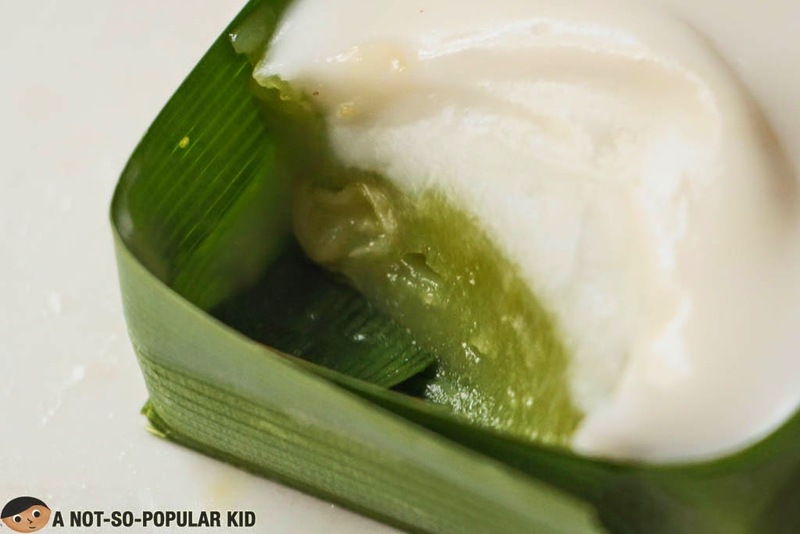 Its creaminess went well with the jelly-like base which was infused with pandan flavor and enhanced by corn bits. 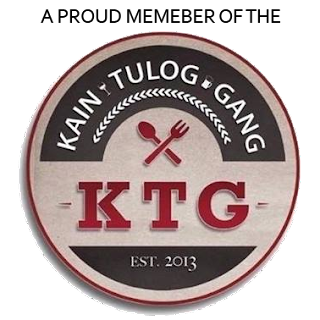 Foodie friends, you should really try this one! You'll love how playful this dessert is! I wasn't able to give the coffee a try because, as I mentioned before, I'm not much of a coffee drinker. Anyway, what I would say on this is that I got amused by the process! Hot water is poured on top,blends with the coffee powder and drips as fresh brewed coffee. Amazing! Just Thai Restaurant really left a positive impression on my in terms of Thai Cuisine, and I think I got hooked! What I love the most about this particular experience is how each dish surprised me by providing a rather different taste as opposed to the concept I had in mind upon sight. As a result, each dish was able to offer something new to me as a foodie! Note, however, that in order to maximize the appreciation of dishes here in Just Thai, you need to keep an open mind, and let the ideas & flavors flow in!